Over at Alota rubberstamps you can buy 6 lesson cds from alota rubberstamps. 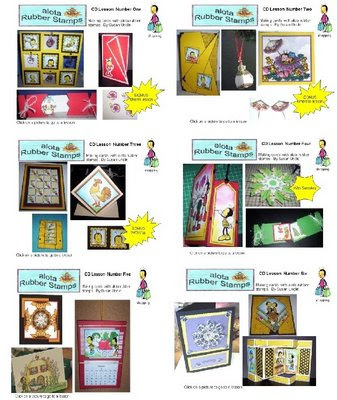 Easy to follow card making lessons using alota rubberstamps 3 cards on each cd plus some have a bonus on them. They are are also have a "Trick Or Treat Stamping Sale" They also have grab bags on sale. The sale is posted right on there home page. Be sure to look at all the cards in there gallery to get some great creative ideas. They also have some wonderful new stamps listed in the "New Stamps and Supplies" catagory.